ABSTRACT. Juveniles (3.5 ± 0.3 g) of the white shrimp Litopenaeus vannamei were grown during 40 days with no water exchanges, no food addition and four initial densities (25, 50, 75 and 100 g m-3, corresponding to between 8 and 32 shrimp m-2), to determine growth rates, which could be achieved using the periphyton growing on artificial substrates as the only food source. The experimental culture units were 12 polyethylene 1 m3 cylindrical tanks with 4.8 m2 of total submerged surface (bottom and walls), provided with 7.2 m2 of artificial substrate (Aquamats™). There were no significant differences in the ammonia and nitrite concentrations determined in the four treatments (0.17-0.19 and 0.10-0.11 mg L-1, respectively), which remained below the respective levels of concern for shrimp cultures. 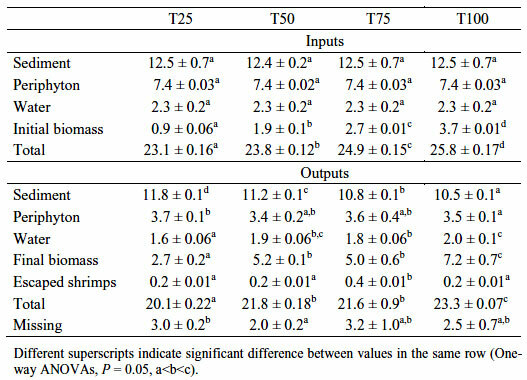 Mean survival was similar, and ranged from close to 91 to 97%, whereas there were significant differences in mean individual weight, which ranged from 11.9-10.6 g shrimp-1 for the two low initial densities (25 y 50 g m-3), to 8.3-7.7 g shrimp-1 for the other treatments. However, because of the high survival and of the higher initial density, the best biomass yield was with 100 g m-3. The final nitrogen contents of sediment and water were lower than the initial values, and between 36 and 60% of the difference was converted into shrimp biomass. Keywords: Litopenaeus vannamei, artificial substrates, nutrient recycling, biofilm, nitrogen budget, water quality, Mexico. RESUMEN. Durante 40 días se cultivaron juveniles de camarón blanco Litopenaeus vannamei con un peso individual de 3,5 ± 0,3 g y biomasas iniciales de 25, 50, 75 y 100 g m-3 (equivalente a 8-32 ind m-2), sin cambios de agua y adición de alimento, para determinar la tasa de crecimiento usando como única fuente de alimentación el perifiton desarrollado en sustratos artificiales. Se utilizaron estanques cilíndricos de polietileno de 1 m3 con tres réplicas por tratamiento, con una superficie de 4,8 m2 (paredes y fondo) y 7,1 m2 de sustrato artificial (Aquamats™). No se encontraron diferencias significativas entre las concentraciones de amonio (0,17-0,19 mg L-1) y nitrito (0,10-0,11 mg L-1) determinadas en los cuatro tratamientos. La supervivencia fue similar, variando entre 91 y 97%. La ganancia en peso individual fue significativamente mayor en los tratamientos con menor biomasa inicial (25 y 50 g m-3), aunque por la mayor densidad inicial, el mejor rendimiento en biomasa se observó en los cultivos sembrados con 100 g m-3. Los contenidos de nitrógeno determinados al final del experimento, en el agua y sedimento, fueron inferiores a los valores iniciales, y entre el 36 y 60% de sus diferencias se recuperaron en biomasa de camarón. Palabras clave: Litopenaeus vannamei, sustrato artificial, reciclamiento de nutrientes, biopelícula, balance de nitrógeno, calidad de agua, México. The high cost and the large amounts of formulated feed may become an important limiting factor for intensive shrimp culture. In addition, shrimp metabolism and leaching of organic substances from food and feces may cause poor water quality and pond bottom deterioration (Burford & Williams, 2001; Avnimelech & Ritvo, 2003), because of the inverse relationship between food assimilation efficiency and culture density (Martin et al., 1998; Zaki et al., 2004). There are several solutions to the water quality problem: the traditional way is an increase of water exchange rates. However, this practice increases the operating costs due to the high water and energy consumption, and the lower retention time of nutrients within the culture systems, that would otherwise be available for biogeochemical recycling by bacteria and phytoplankton, thereby increasing the availability of natural food (Jackson et al., 2003; Crispim et al., 2007). Other solutions involve the removal of nutrients either outside or within the culture system. In the first case, nutrients are removed through different combinations of physical, chemical and biological processes, such as mechanical filters, settling tanks, ozonation or U.V. irradiation, and various types and designs of biological filters (Timmons et al., 2002; Hussenot, 2003; Gutierrez-Wing & Malone, 2006). An alternative is the promotion of growth of natural planktonic or benthic microbial and microalgal communities (bioflocs and periphyton, respectively) present in the pond environment, because their utilization of nutrients through autotrophic and heterotrophic processes accelerates the removal of organic and inorganic wastes, thus improving water quality; in addition their biomass can be used as a source of food by the cultivated organisms (Azim et al., 2002; Avnimelech, 2005). Both techniques have shown to increase fish and shrimp production in semi-intensive or intensive experimental or commercial cultures (Browdy et al., 2001; Keshavanath et al., 2001; Lopes-Thompson et al., 2002; Van Dam et al., 2002; Avnimelech, 2007). In particular, several studies have shown that the bacterial and microalgal biofilm growing on natural or artificial submerged substrates (periphyton) may be used successfully as the main or sole food source for several freshwater or brackish water fish species (Ramesh et al., 1999; Azim et al., 2002, 2004; Jana et al., 2004; Keshavanath et al., 2004). However, available information for shrimp culture is limited to some studies on intensive cultures, with formulated feed as the main food source (Bratvold & Browdy, 2001; Otoshi et al., 2001; Domingos & Vinatea, 2008; Audelo-Naranjo et al., 2011). The aim of this work was to evaluate the growth and production of juvenile Pacific white shrimp L. vannamei, maintained at four initial stocking densities in experimental cultures with artificial substrates, with zero water exchange and no food addition. The experiment lasted 40 days, from July 2 to August 10, 2009, and was performed on the grounds of a commercial farm close to the Urías Estuary, Mazatlán, Sinaloa, NW Mexico (23°25'N, 106°22'W), which is the source of seawater used by the farm for pond filling and water exchanges. Juveniles (3.5 ± 0.3 g) of L. vannamei obtained from this farm were stocked in triplicate tanks, with four initial stocking densities (25 ± 7.5; 50 ± 2.3; 75 ± 2.8 and 100 ± 2.5 g m-3: T25, T50, T75 and T100, respectively), equivalent to 8, 16, 24 and 32 ind m-2. The experimental units were 12 cylindrical heavy-duty polyethylene tanks (1 m3, bottom surface: 1.1 m2 and submerged walls: 3.7 m2). One week before the experiment, each tank received a 10 cm-deep layer of homogenized, untreated sediments of an intensive shrimp farm, and was filled with 1 m3 of 300 μιη-filtered estuary water. Since no formulated feed was supplied, shrimp fed only on the periphyton growing on the tank walls and on the 7.1 m2 (both sides) of the artificial substrates (Aquamats®, Meridian Applied Technology Systems, Calverton, Maryland, USA), which had been remained submerged in the pond water to allow periphyton growth during the previous 30 days and added in a circular arrangement to each tank one day before the experiment, at a distance of 10 cm from the tank wall (Audelo-Naranjo et al., 2010). Throughout the study period, the experimental units were maintained with zero water exchange, but water was added once per week to each tank (on average 5% of the tank volume) to compensate the water lost by evaporation. Continuous aeration was supplied by a 1 HP blower (0.768 kW; Sweetwater 1HP, Aquatic Eco-Systems, Apopka, FL, USA) to avoid thermal stratification and for renovation of the water in contact with the submerged surfaces. Temperature and dissolved oxygen concentrations were measured twice daily (8:00 and 18:00 h), using an air-calibrated YSI model 57 oxygen meter (YSI, Yellow Springs, OH, USA). Salinity and pH were measured at 14:00 h with an Atago S/Mill-E refractometer (Atago, Tokyo, Japan) and a Hanna HI 98150 field pH meter (Hanna Instruments, Woonsocket, RI, USA). During the first day of the experiment, triplicate samples of the water used to fill the tanks were filtered through Whatman GF/C filters to determine the concentrations of dissolved inorganic (N-NO3-; N-NO2-; N-NH4+) and organic N (DON) using traditional colorimetric techniques (Strickland & Parsons, 1972). The particulate organic N (PON) retained on the filters was determined using the method described by Holm-Hansen (1968). The same methods were applied to obtain information on the dissolved and particulate N added weekly to each unit with the water used to replace water losses. Unionized NH3 was calculated as in Spotte & Adams (1983). The initial and final organic nitrogen content of the sediment and of the accompanying micro- and meiobiota were determined with the Kjeldahl method (AOAC, 2005), in triplicate un-sieved samples obtained from the center and sides of each tank, during the first and during the final day of the experiment. The same method was used to determine the initial and final N content of shrimp, and of triplicate samples of the periphyton, obtained by scraping with a scalpel a known area of the substrate (Audelo-Naranjo et al., 2010). At the beginning and at the end of the experiment, all organisms were counted and weighed individually. Survival (S%) was calculated as S% = 100 (Nf Ni-1), where Nf and Ni are the final and initial numbers of shrimp. The mean individual initial and final weights of the specimens of each unit were used to calculate the mean daily growth rate (GR) as GR = (Wf-Wi) t-1, where Wf and Wi are the final and initial wet weights (g), respectively, and t is the duration (days) of the experiment. where the inputs were: Wi = total N content (dissolved and particulate) of the water used for tank filling and weekly additions, initial N contents of the shrimp biomass (Bi), of periphyton (Pi), and of the sediment and accompanying micro- and meiobiota (Si). Outputs: final N content of the sediment (Sf), of the shrimp biomass harvested (Bf), of the periphyton (Pf), and of the water discharged at the end of the experiment (Wf). An additional output were the shrimps escaped overnight from the experimental units, which were collected the following morning, weighed, frozen and analyzed separately. The mean values of temperature, dissolved oxygen, pH, salinity and dissolved nutrient concentrations were compared using repeated measures ANOVA tests, or the equivalent Friedman's non-parametric test when the data were not normal or homoscedastic (Kolmogorov-Smirnov and Bartlett's tests). The mean values of final yields, survival, individual weights, and growth rate were compared using one-way ANOVA or Kruskall-Wallis tests, after arcsine square root transformation in the case of final survival. In all cases, the level of significance was P = 0.05 (Zar, 1996). There were no significant differences between the mean water characteristics: morning and afternoon mean water temperatures and dissolved oxygen concentrations ranged from 28.5 to 31.5 °C and between 6.1 and 6.3 mg L-1, respectively. The mean pH value was 8.4 in all treatments, and salinity varied between 37.4 and 37.5 g L-1. Ammonia and nitrites remained between 0.17-0.19 and 0.10-0.11 mg L-1, respectively, and the mean values of calculated unionized ammonia were below 0.03 mg L-1; nitrates varied between 0.26 and 0.29 mg L-1. The mean DON and PON concentrations determined in the four treatments were similar, and ranged from 0.78 to 0.79 and from 1.27 to 1.29 mg L -1, respectively (Table 1). Table 1. Mean values (± standard deviation) of daily water temperature (T°C) and dissolved oxygen concentrations (DO: morning and afternoon readings, am and pm, respectively), pH and salinity (afternoon readings), and weekly nutrient concentrations in the cultures of Litopenaeus vannamei with artificial substrate (Aquamats™) and increasing initial biomass (25 to 100 g m-3). Tabla 1. Valores medio (± deviación estándar) de los registros diarios de temperatura (T°C) y oxígeno disuelto, pH, salinidad y concentración semanal de nutrientes por tratamiento y horario en los cultivos de Litopenaeus vannamei con sustrato artificial (Aquamats™) e incremento de biomasa inicial (25 a 100 g m-3). Mean final survival varied between 90.7 and 97.3%, without differences between treatments. In the case of mean final weights and daily growth rates, there were no statistically significant differences between the two low biomass treatments (25 g m-3: 11.9 ± 2.6 g and 0.20 ± 0.05 g day-1; 50 g m-3: 10.6 ± 1.2 g and 0.17 ± 0.02 g day-1, respectively). Both were significantly higher than the high-density treatments with final weights of 8.3 ± 0.3 and 7.7 ± 0.5 g, and growth rates of 0.10-0.11 ± 0.01 g day-1. There were also significant differences in mean final yields: the lowest and the highest (73.6 ± 4.7 and 199.6 ± 19.9 g experimental unit) were those of the tanks stocked with 25 and 100 g of initial biomass. The tanks stocked with 50 and 75 g gave intermediate values (145.5 ± 3.5 and 139.6 ± 16.6 g), and there was no difference between these two treatments (Table 2). Table 2. Mean values (± standard deviation) of production variables in the cultures of the white shrimp Litopenaeus vannamei with artificial substrate (Aquamats™) and increasing initial biomass (25 to 100 g m-3). Tabla 2. Valores medio (± desviación estándar) de las variables de producción de los cultivos de camarón blanco Litopenaeus vannamei con sustrato artificial (Aquamats™) e incremento de biomasa inicial (25 a 100 g m-3). Since no food was added, the major nitrogen input to the experimental units was that contained in the initial sediment, followed by that of the periphyton (12.5 and 7.4 g m-3, respectively, composed mainly by bacteria and alg ae, as well as ciliates, nematodes, occasionally with copepods and amphipods, and few polychaetes). The contribution of initial biomass (nitrogen content: 3.68 ± 0.09%, wet weight) was between 0.9 to 3.7 g m-3, depending on the initial density; the water used to fill the tanks and for weekly additions added 2.3 g of N to the mean total inputs. Among outputs, the N contents of sediment (11.8 to 10.5 g m-3), periphyton (3.7 to 3.5 g m-3, both decreasing with increasing initial shrimp biomass-3), and water (1.6 increasing with biomass to 2.0 g m-3) were lower than the initial values: sediment was the main N compartment, and the values decreased with increasing stocking density. The increased N content of the shrimp biomass (in this case increasing from 2.7 to 7.2 g m-3, depending on stocking density) represented between 34 and 60% of the difference between the initial and final values of sediment, water and periphyton. The N content of the shrimp escaped from their tank represented only 0.2 to 0.4 g m-3. Therefore, between 2 and 3.2 g of N were missing from the global budget (Table 3). Assuming similar growth and grazing pressure as on the Aquamats, the biofilm on the tank walls (3.7 m2), and on aeration lines and air stones (approximately 0.8-1 m2) could not contain more than 0.2-0.25 additional g. Therefore, the remaining N was probably lost to the atmosphere, either as molecular N produced through denitrification or more probably, in view of the aeration provided, as gaseous NH3, which represented on average 11% of the total ammonia present in the tanks. Table 3. Nitrogen budgets in the culture of the white shrimp Litopenaeus vannamei with artificial substrate (Aquamats™) and increasing initial biomass (25 to 100 g m-3). The values are mean ± standard deviations of the N inputs and outputs (g). Tabla 3. Balance de nitrógeno en el cultivo de camarón blanco Litopenaeus vannamei con sustrato artificial (Aquamats™) e incremento de biomasa inicial (25 a 100 g m-3). Valores medio ± deviación estándar de los ingresos y egresos de N (g). The mean temperature, dissolved oxygen, pH and salinity values were well within the appropriate ranges for L. vannamei culture (Treece, 2000). Salinity was higher than the isosmotic point (approximately 20 g L-1) which may have a negative effect on the energy budget of the white shrimp (Valdez et al., 2008), although values as high as 40 g L-1 does not seem to affect significantly the growth rate of this species (Ponce-Palafox et al., 1997). 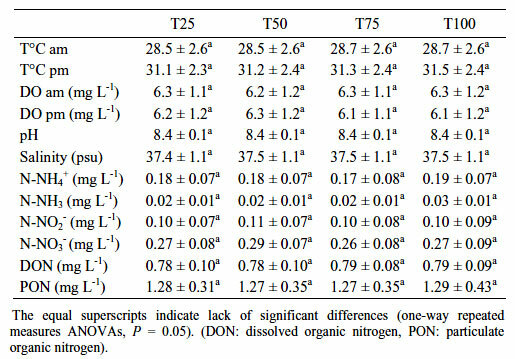 Dissolved and unionized ammonia, as well as nitrite and nitrate values remained below the respective safety levels for shrimp culture (7.09, 0.13, 25.7, and 232 mg L-1, respectively) (Frías-Espericueta et al., 1999; Tsai & Chen, 2002; Lin & Chen, 2003). This confirms the importance of the microbiota adhered to the submerged surfaces, which used the dissolved and particulate nutrients present in the water column and in the sediments for their growth and development. Thus, the periphyton served to maintain water quality and to provide food for the cultured shrimp, and the low final nitrogen concentrations in water and sediment prove that its metabolism was adequate to prevent deterioration of the culture environment. Additionally, the weight gain of the shrimp confirms the importance of the biota associated to artificial substrates as a natural food source for farmed organisms. This community forms a complex food web, in which the consumers and detritivores use autotrophic microorganisms as their food source, and the dissolved organic and inorganic nitrogen produced by their metabolism is recycled into new biomass by the autotrophic microalgae-bacteria mats. In the trophic structure of the experimental units, shrimp were the top consumers, and therefore were the final beneficiaries of the nutrient and energy flow of these closed systems. The best final individual weights (11.9 and 10.6 g), were obtained with the intermediate initial stocking densities (25 and 50 g of initial biomass, equivalent to 8 and 16 ind m-2, respectively), and the best biomass gain was with the highest initial biomass, although the individual weight gain was not as high as that obtained with the two lower stocking densities. In all cases, the regime of closed culture promoted nutrient recycling, provided sufficient food for the cultured organisms, eliminated the cost of formulated feed and water exchanges and was, at the same time, environmentally friendly because it minimized the environmental impact of nutrient-loaded effluents. Culture experiments with mesocosms should not be used to calculate possible yields of full-scale cultures or for cost/benefit analysis, but to verify the feasibility of a different approach for large-scale cultures. However, on the basis of these results, shrimp may be grown successfully in closed cultures using submerged substrates. Once the proper biological load is established through additional work at the pilot scale, periphyton may maintain water quality and serve at the same time as the main or even as the only source of food, with yields close or higher than the <1000 kg ha-1 which, according to official statistics (SAGARPA, 2010), is the mean yield of most Mexican semi-intensive shrimp farms. Supported by PROFAPI2011/016 and CIBNOR project AC0.38. V. Nuñez, O. Zamudio, B. Mejía and J. Madero of the Academic Group 'Shrimp and Fish Culture' helped with the field and analytical work.